Today, I'm been invited to spend a few days with another family member (Hong-Yin) in Taichung (台中; literally "Central Taiwan"). We stopped over at Sanyi (三義鄉). It is famous for its mudiao 木雕(woodcarving) industry. Driving up the mountain we encountered an old railway station that was built there by the japanese. Nearby you'll find a street market called the Sanyi old street. Next stop was the Longteng broken bridge. 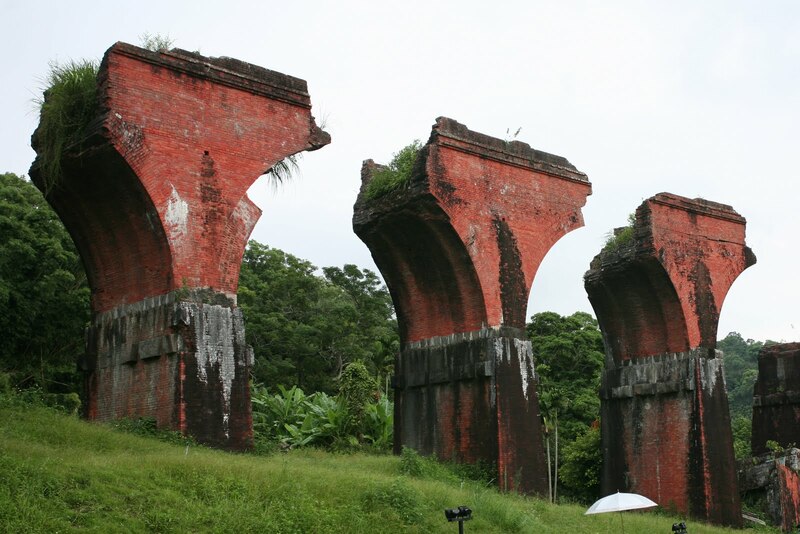 The remains of this red-brick viaduct are located deep in the hills, about 4km past Shengsing Village, along country road 49. The bridge was built in 1905 and collapsed in 1935 when the Hsinchu Earthquake rocked Taiwan. There isn't much to do there except to relax at a small cafe. If your walking up this road, you may just need that break. It was a nice site none the less. Our final stop was Chateau in the Air. It is a large house built by an artist from old iron, wood and cement. The parts that aren't covered in vines have cute stone animals decorating the walls. Inside you'll find it converted to a large cafe serving deserts, teas and coffee. 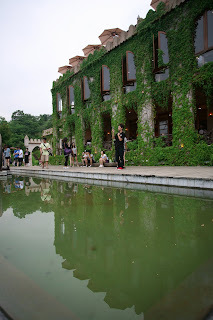 The website for it is www.chateau-in-the-air.com.tw. It was great to get out of the city and start seeing the lush green Taiwan country side. Hong-yin is Lucy's mom's sister, your Da's elderest brother's elder daughter, her son Liyang(Leon) is staying at our house now. Taichung has my favorite milk cany with almond(Italian style), it is so....good, better than the one from Italy.